This scene has one of my favorite treasures, a blue milkglass bird-on-nest. It was given to me by my parents. 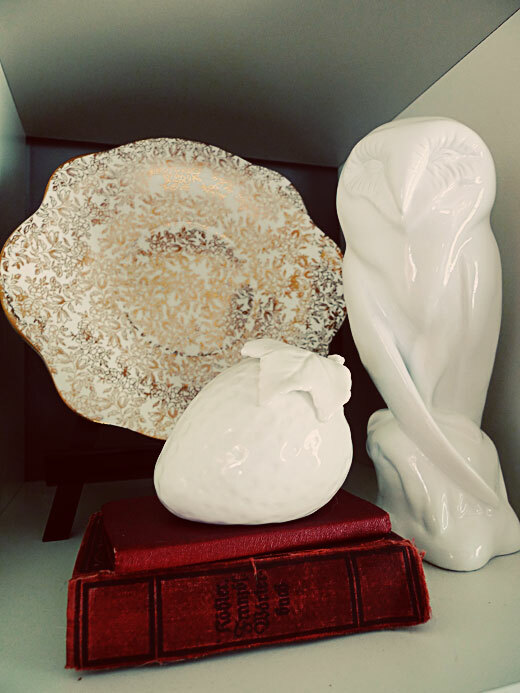 The white branch vase is fantastic, a gift from my favorite sister-in-law. The teacup is from a marvelous set I purchased for a steal at my favorite antique store, which is sadly closed. What is hiding in the teacup, you ask? Sleeping acorns, of course. 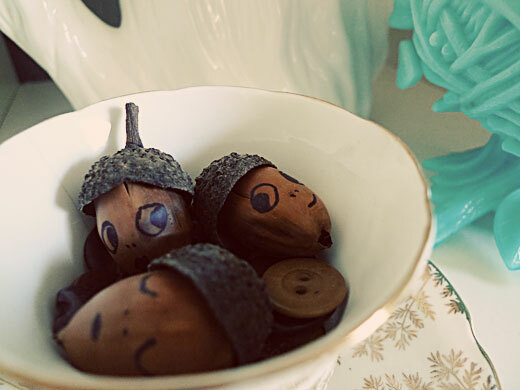 Acorns and buttons. Annie put their faces on and now that I know them, I can't bear to toss them out. The gold plate is from that same marvelous tea set. The white ceramic strawberry is from TJmaxx, and the red books .. I can't remember, maybe they just appeared. The barn owl is made of plaster or something, and I love it. It snuggles in your arms like a baby. It came from ZGallerie, but they no longer carry it. This little stack fits in perfectly next to our Wii. 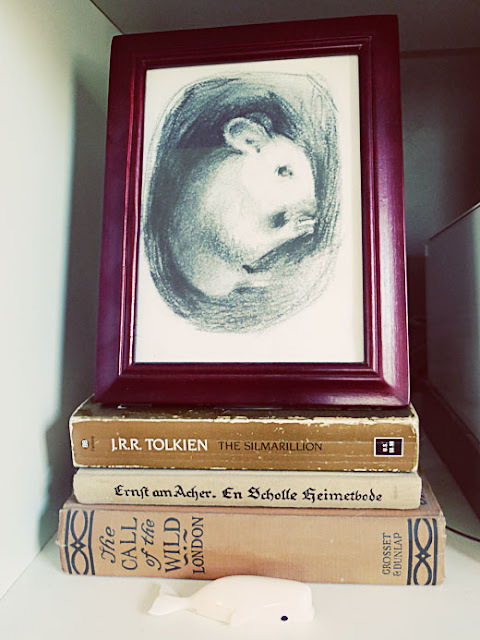 The mouse drawing is from Annie. Are you jealous of my artwork? Get your own Annie original at this lovely party. The little whale is trying to fade away, can you see him? I got him at an estate sale for 25 cents. His name is Victor, and I know this because someone carved his name quite carefully into his underside. One time Victor fell off the shelf and his tail broke but I glued it back on. 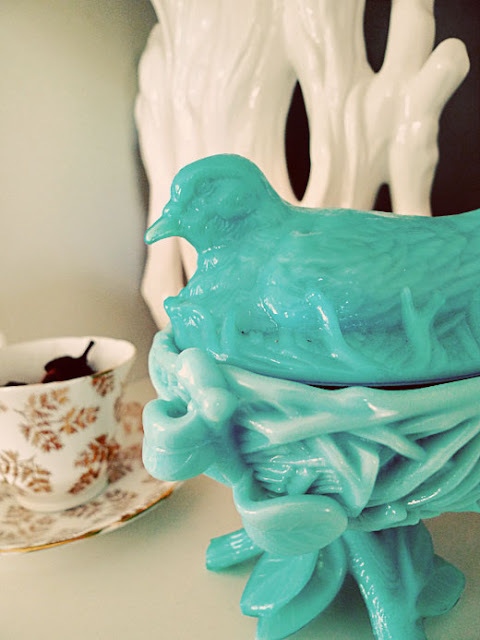 oh my gosh, that bird on nest piece is so stunning!! that's definatley a piece that's i'd love to have. the color is fabulous indeed! Thanks Jen! Hope you get one of your own someday.